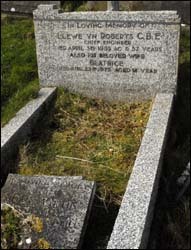 Born in 1882, Llewelyn Roberts was educated at Llandudno’s Collegiate School. After training as an engineer, he joined the Cunard Steamship Company aged 23. This was the start of a 35-year career which saw him working on some of the most famous ships of that era. In the period before the First World War, Llewelyn learnt his trade on the liners Mauretania and its sister ship Lusitania. The latter was the world’s biggest ship when launched. It was sunk by a German U-boat in 1915 with the loss of over 1,100 lives. During the war, Llewelyn held the commission of Engineer Lieutenant Commander in the Royal Naval Reserve and was engineer on the requisitioned troopship, Andania, when it landed troops at Suvla Bay during the Battle of Gallipoli. In 1918, the Andania was torpedoed by a German submarine off the coast of Ireland and Llewelyn was among the 230 people who were saved. In 1933 he assumed a land-based role at Clydebank as chief engineer on the propelling machinery of the Queen Mary, Cunard’s new £3.5m flagship liner (pictured right). He was on the ship's maiden voyage from Southampton. In December 1936 Cunard White Star Line started laying down the even larger Queen Elizabeth, and chief engineer Roberts again oversaw construction of the propellers. However, he died suddenly in April 1939, before the new liner’s completion. For his service to the British mercantile marine, Llewelyn Roberts was awarded the honour of Commander of the Order of the British Empire (CBE).